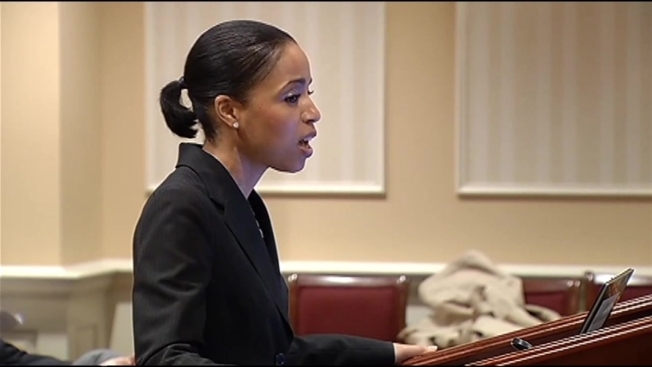 State's Attorney Angela Alsobrooks testified before Maryland lawmakers Wednesday about the need to criminalize threats of mass violence. Alsobrooks testified in support of legislation that would make it a misdemeanor crime for someone to threaten an act of violence against five or more people. "As we see these cases from Colorado to Newton, these threats are real threats," Alsobrooks said. The bill carries a 10-year maximum prison sentence, and anyone found guilty would be required to pay the cost of the public safety response. "I don't think this bill will address or prevent the kind of shooting we had at Columbia Mall," Sen. Brian Frosh (D) said. For example, Frosh said the bill would have addressed Darion Aguilar's attack on the mall, had he called in a bomb threat. "Then they find the person who made the call and charge them with a crime," he explained. Prosecutors say the bill was inspired in part by a 2012 case in which a man accused of threatening violence against his employer was charged with misuse of a telephone. The case was ultimately dismissed. Maryland is only one of seven states in the country that does not make it a crime to communicate a threat of mass violence.